Since an excursion in Red Rock Canyon, NV that involved Breezy tearing off a nail (slipping on a wet rock) and wearing her claws down rock climbing she has gotten very used to wearing boots. We primarily use them to shield from red ants and foxtails, protect from the hot ground, and to prevent ice from collecting between her toes in the snow. For all of these purposes I’ve used the same type of boots. 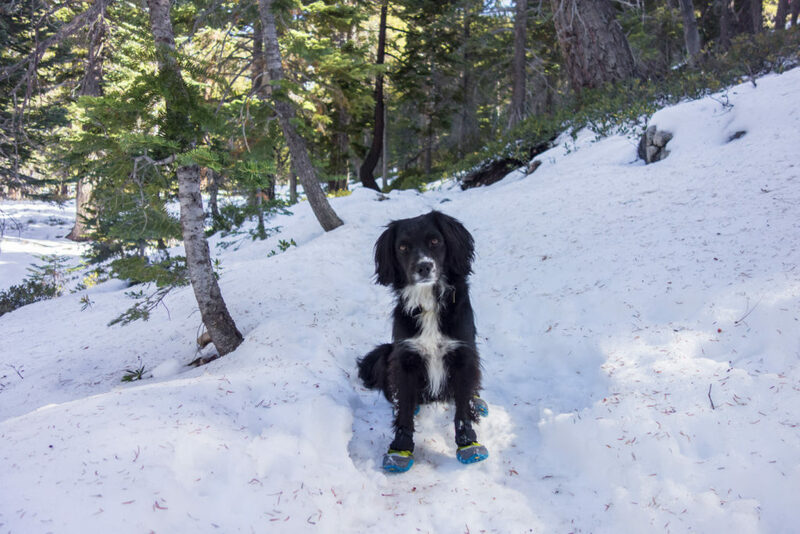 As we don’t often face frigid temperatures on our adventures the Ruffwear Polar Trex are our first foray into specially designed winter boots. We have to drive to find snow, so properly cold and snowy climates feel free to commence giant eye roll and take this review with a grain of salt (which we also don’t have to deal with :P). These boots can be broken down into three sections: a soft rubber outersole, a breathable sturdy cloth with adjustable velcro closure upper, and a stretchy pullover gaiter top. The base of the boot is a soft Vibram Icetrek rubber that we found to be extremely sturdy. The outersole has shown minimal wear on our adventures so far and, unlike cloth boots, they will likely last through many years of adventuring. The upper boot is insulated for winter but thinner than I expected, opting for breathability over full waterproofing. In smaller puddles and walking through snow, the inside of the boot remained dry. I tested the waterproofness at home by running them under the tap and it took about a minute for it to soak through. 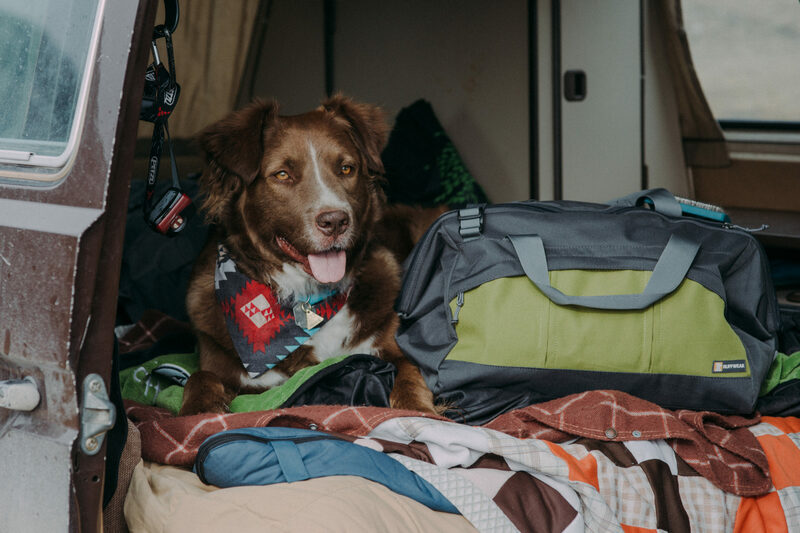 On typical snow days the weatherproofness should be sufficient but if your winter adventures have you crossing rivers you may want to ensure your pup doesn’t spend too much in water. On the plus side, if the paws do get wet, the breathable fabric should allow them to dry and not lock in the moisture. One thing that makes the Polar Trex really unique is a gaiter designed to keep snow out of the boot. 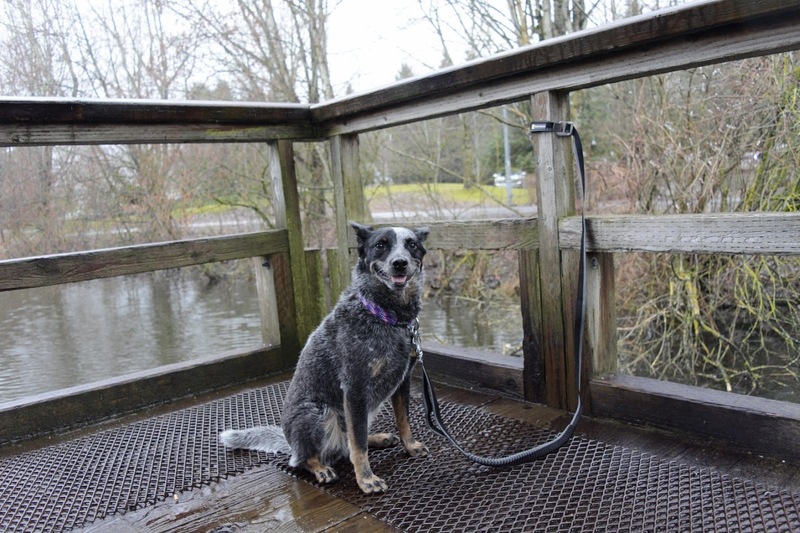 Being a smallish dog (16.5″ at the shoulders), outside of a packed down trail, Breezy’s usually in past her belly. The gaiter really helped keep the snow out of her boots. While a small amount of snow did get into the gaiter, none made it past the velcro. In colder temperatures where the primary goal is to keep the feet dry and free of snow/ice build up, these boots would work great. It’s important to note that the velcro strap is the key to getting these boots to stay on – while it may seem like the zipper on the gaiter will help we found out the hard way that this isn’t the case. When we had them properly fit to Breezy they didn’t fall off. To familiarize Breezy with wearing these boots we practiced at home with lots of positive reinforcement and we went on a few short neighborhood walks (on which she did great). I’m glad I put them on so much at home because getting them on was tricky and my struggles were stressful for Breezy. By the time we got to the trail I had it down to a science and we had broken them in quite well. Unfortunately our first trail experience was on hard packed trail ice so she had some unease at the lack of traction. 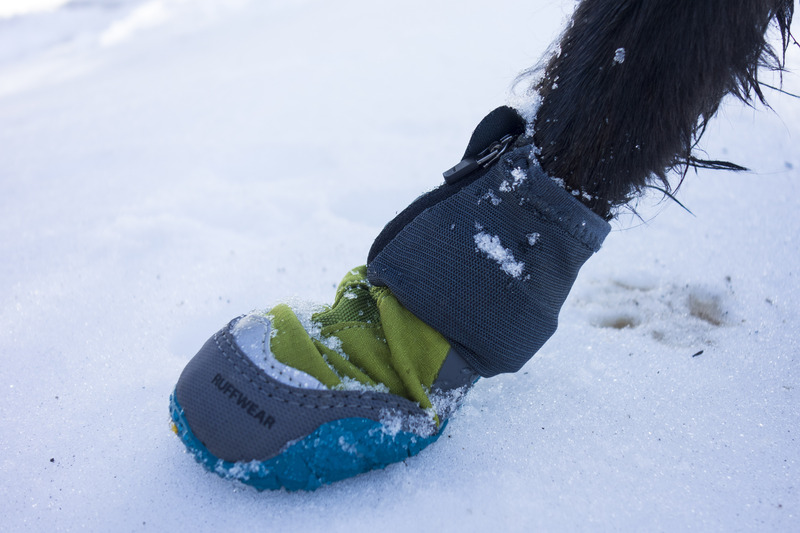 To be fair, I don’t know of any boot that will provide better traction than a dogs built in crampons, aka their claws. 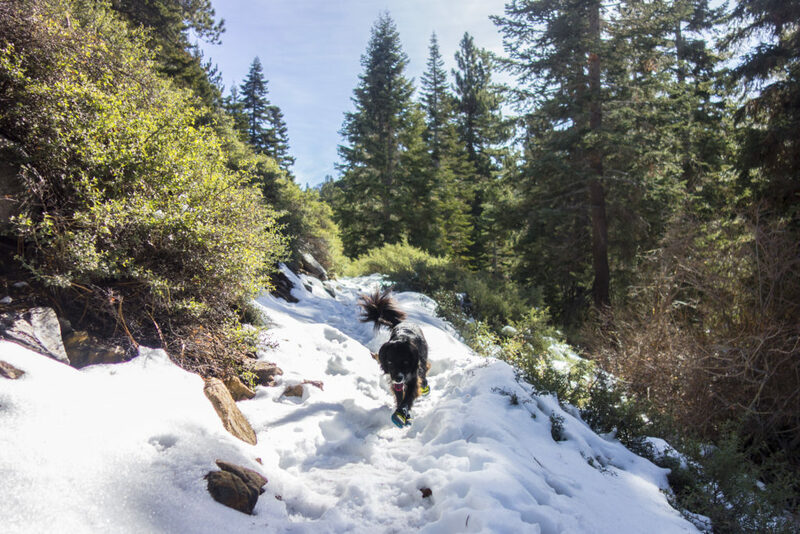 While the boots are designed with a winter-specific lug pattern, we found she was slipping a lot on the ice, was nervous to run and very uncoordinated when she attempted to jump. This is fairly common in a lot of dog boots and I’m not sure what the solution/fix would be. 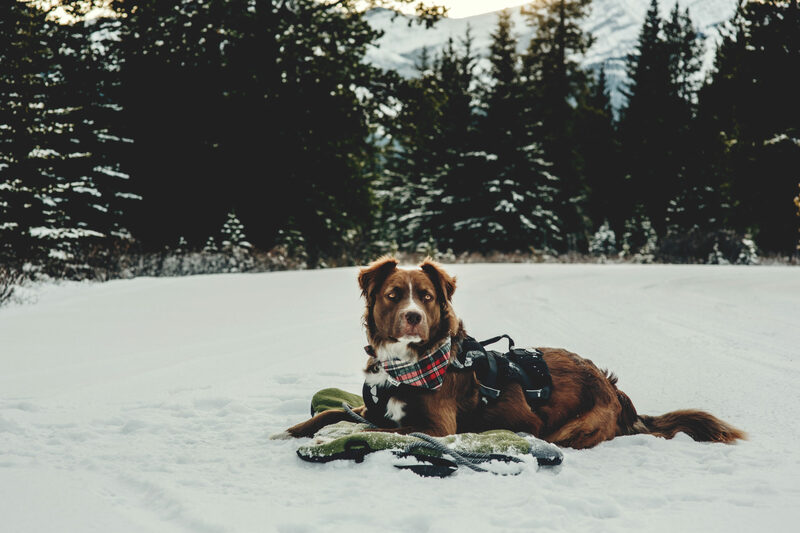 Leashed dogs likely wouldn’t face the same issues, however, if your dog is slipping on ice it’s important to make sure they aren’t forming any negative association to the boots. Ensure that you practice with them in non slick environments so your dog continues to build confidence walking in them. In the soft fresh snow we found that the boots worked very well. Breezy had no issues with traction and was her usual happy self, even darting up a snow bank after a squirrel! If you adventure in fresh/loose snow more than hard packed/icy snow these boots would serve you well. We noticed that these boots are quite large in the foot and quite small around the ankle, meaning for little paws and fluffy ankles it can be a bit of a challenge to get them on and they aren’t quite as snug around the paw once they are on. Because they only have one velcro strap and the zipper doesn’t aid with snugness, I found these to be less adjustable than other boots we’ve tried. Though, we didn’t have any issues with the boots twisting around at all. 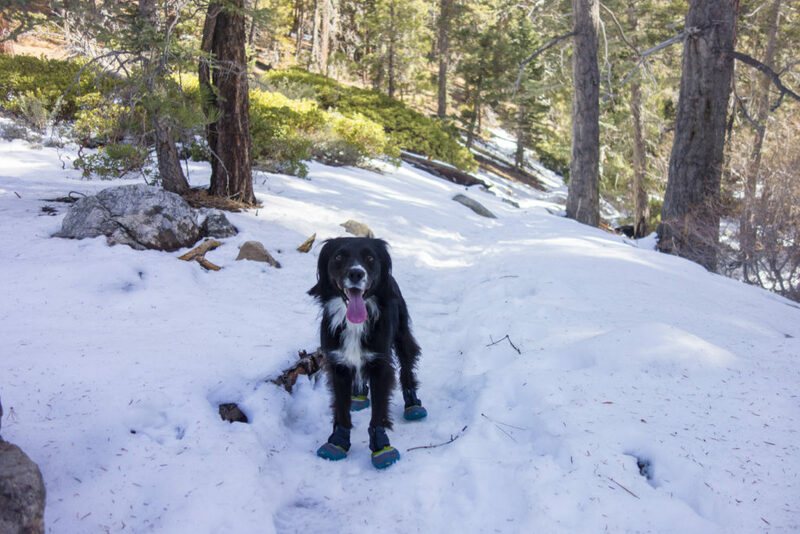 Ruffwear also offers Bark’n Boots Liners to enhance the fit and of the boots (and provide additional padding for dogs with dew claws) but we did not test them as part of this review. We would also love if these boots came in an alternative color – one that might stand out a bit more if a boot comes off as the green/blue/grey blends in to the snow a little too well sometimes. The last thing I’ll mention about these boots is the price. These boots are quite a bit pricier than other boots on the market and come in around $100 USD for a set of four. You can’t put a price on safety and keeping your dogs feet protected, but if you have a bit of anxiety as I do, you may worry about losing a boot so make sure you do up those velcro straps!